The 400 block of Peoples between Chaparral and Mesquite Streets, looking east toward the bay. Downtown cross streets running perpendicular to the bay (Peoples, Schatzell, Lawrence, William, Laguna, etc.) acted as sluice gates for the storm waters, turning the streets into raging torrents. 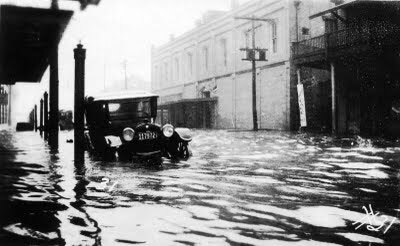 Water is rising above the running board of a car left on the street as Peoples Street is flooded by the first wave of the storm. Water was knee high after the first wave came ashore on Sunday around noon. A view of Lawrence Street between Water and Chaparral Streets. The building in the center of the photograph is the Kenedy Pasture Company. In the foreground are some of the 14,000 cotton bales washed from the Municipal Wharf into the business district of the city where the storm used them to demolish buildings. Storm debris is piled up beside Lottie Carpenter’s Plaza Hotel, across Chaparral from Artesian Park. The hotel has been lifted and moved into Chaparral Street, but a bed and its mattress remain in place in the second floor of the hotel. Soldiers from Company I, 37th Infantry, who were transferred from Fort Brown in Brownsville to North Beach shortly before the storm, rescued 12 people stranded on the second floor of the hotel. Orders placed in Texas will be taxed. Shipping will add $5.00 per book. 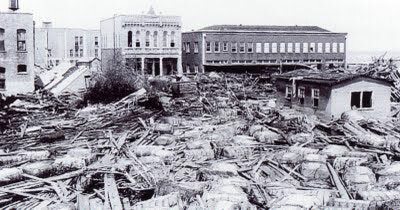 After the storm the downtown was filled with debris from shattered buildings and piers and thousands of cotton bales from the Municipal Wharf. 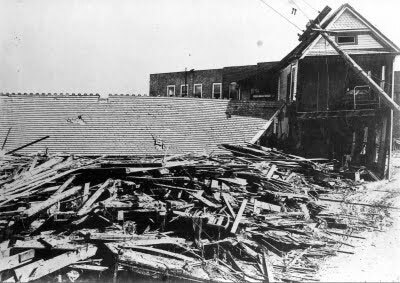 The cleanup involved the entire city and resulted in a mountain of debris piled at the edge of the bay at Hall’s Bayou. The hurricane inspired Corpus Christi in its efforts to secure a deep-water port and build a protective seawall. A history of the storm has not been published until now. 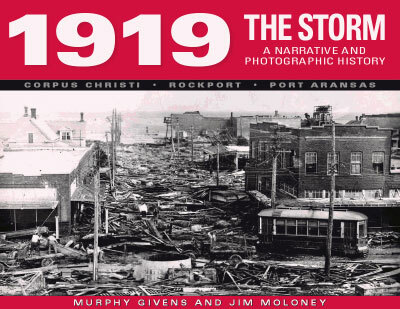 Murphy Givens has collected the tales of survivors and newspaper accounts of the time and woven them into a gripping narrative of death and survival. Jim Moloney has organized photographs from the aftermath of the hurricane to give an understanding of the destruction and the clean-up task facing the battered city. Also included are two first-hand accounts by survivors Theodore Fuller and Lucy Caldwell, five new maps, and a list of the dead.